So the long-awaited 2015 Mayday countdown concert news is finally out! Fulfilling their promise, Mayday is holding their annual countdown concert in Kaohsiung World Games Stadium again. 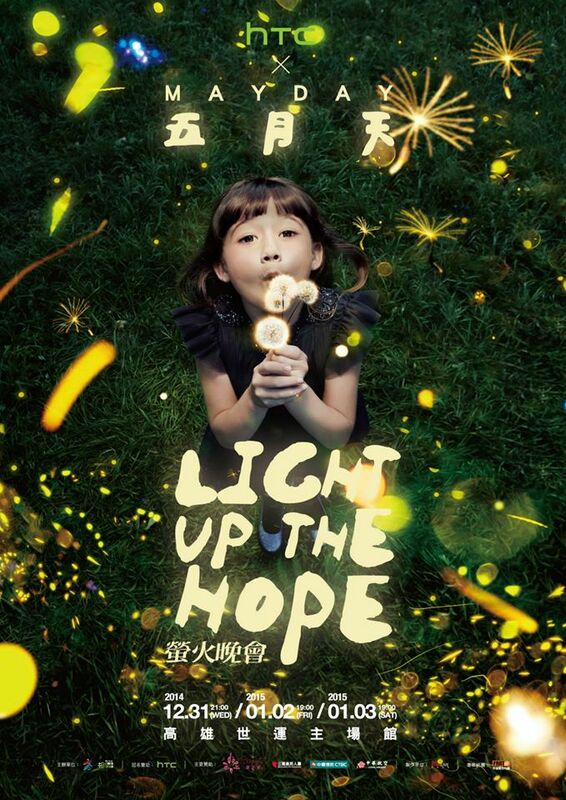 Sponsored by HTC, Mayday’s end-of-year concert is called ‘Light Up The Hope’ (螢火晚會). The theme for this concert seems to be rather heart-warming. Mayday hopes to welcome 2015 with 150000 fans from all over the world. Dates: 31 Dec (Wed) 9 p.m., 2 Jan (Fri) and 3 Jan (Sat) 7 p.m. I am quite surprised by the concert dates. Usually, Mayday will perform on 30, 31 Dec and 1 Jan. However, they are performing later this time around – on 2 and 3 Jan. Looks like Mayday is seriously tempting me to empty my bank account… Well, let’s see how fate plays this out! So are you planning to countdown to 2015 with Mayday? This entry was posted on Monday, November 3rd, 2014 at 10:11 pm	and posted in Mayday. You can follow any responses to this entry through the RSS 2.0 feed. Ha nice to hear from you again! Good luck! Hope we can get tickets! hello! how can I purchase the tickets if i’m not in taiwan? thanks!! You can become a member of the Ibon site. Create an account and then try to buy the tickets online. Good luck! hello! i’ve registered to be a member.. and i think i can just buy the tickets online? how about collection of tickets? how can it be done? They can send you the tickets via post I think. Or you can just collect from the convenience stores – by keying in your ticket collection no. into the ibon machine. they can send the tickets to overseas? is there any deadline to collect from convenience stores? i’ll only be going taiwan end of December, and it’s my first time to taiwan. I believe that they will send overseas. They sent to Singapore for me previously. I am not sure about the deadline for convenience store collection. Good luck! Oh it is super difficult. Pray hard! good luck! Hi, I cant seem to find the Mayday concert details on http://ticket.7net.com.tw/. This is my first time buying a overseas ticket. Feel so lost haha. This is the website. I think the sales information is not out yet. Maybe you can check closer to the sales date! Thanks! Hope I could get a ticket for the concert! I end up buying the China Airline package, that includes the NT3880 tickets. Hello! 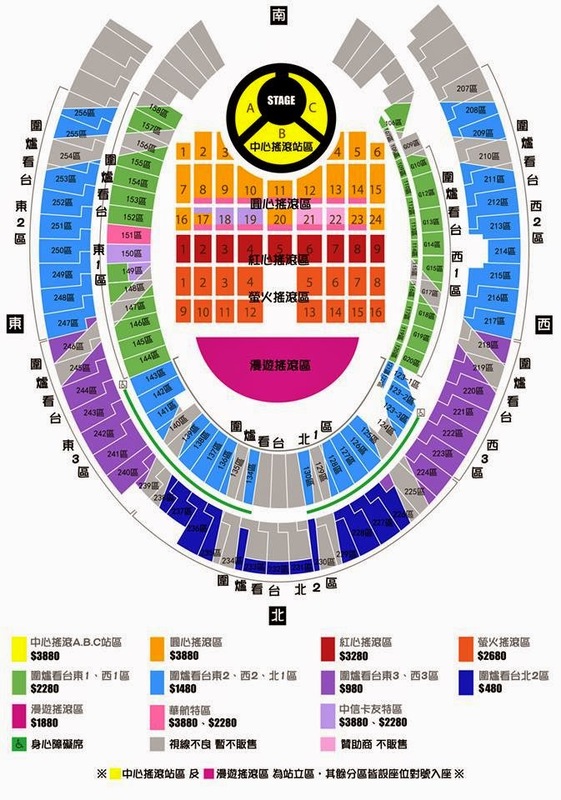 anyone knows where to buy yellow cow ticket (second hand ticket) on the 3 Jan (sat)? If you have, pls wads app me at +852 95775633 or email me! Thanks! I have 2 extra tickets (TWD $1480) for 31/12 concert to give away. Anyone interested can contact me at monkey_den@hotmail.com.